We’re so glad we live in a world that embraces athleisure. It’s become completely socially acceptable to wear stretchy, comfy things historically relegated to the gym anywhere, (almost) anytime we please. Along with this newly begotten freedom are some, ahem, social graces that we think one should consider that differentiate the homely grunge look (wrinkled and faded old tee shirts) from chic athleisure. Keep on reading to see how to wear athleisure like a pro! First things first, What is Athleisure? Athleisure is an easy-to-wear hybrid of gym wear and street sartorialist. Since 2014, the trend has been steadily rising, and thankfully so. We love saying yes, to any and every opportunity to be comfortable while looking stylish. And, fortunately, for comfort-loving women everywhere, it doesn’t seem to show any signs of slowing down. There are many ways you can make athleisure work for you. Be your own style muse and get inspired by your personal taste, the things you already have and love and try to incorporate them with other athleisure pieces. Color-blocking is a fun way to brighten your look, but you can never go wrong with a palette of neutrals like grey, black or white. And, if you fancy black (or any other color) leggings, be sure to choose ones that are thick enough to cover you in all the right places. Most of all—have fun and make it your own. A hoodie is one of the solid building blocks to athleisure. In the cooler months, it’s the layering piece that you want, and let’s be real—you need it for the cold—to pair with your pullover knits or under a denim jacket. In the warmer months, easily tie it around your waist if you get too hot or pair it with a loose pair of camo joggers and slip-on sneakers when the air conditioner is set at arctic. The right sneakers are key to pulling off a chic athleisure look that reads more sophisticated than sloppy. Clean and pristine sneakers can elevate a casual look and make it appear more intentional, and not like you just rolled out of bed. 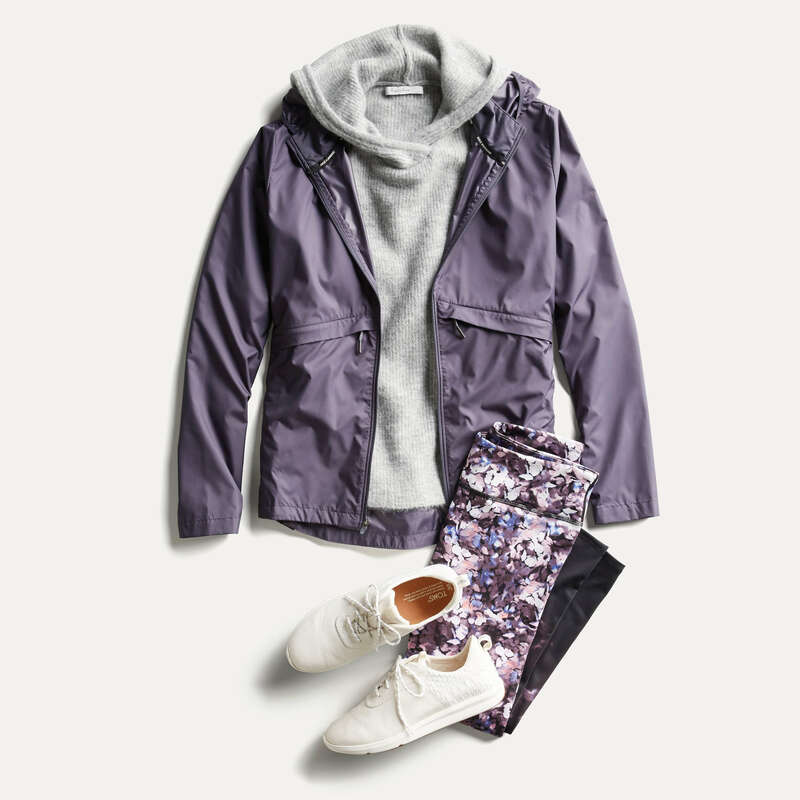 Add a soft hooded sweater with your printed leggings and you’re ready to head out the door looking sharply pulled together. Leggings are the champion piece that everyone deserves in their athleisure wardrobe. What could feel more delightfully comfortable than your favorite pair? 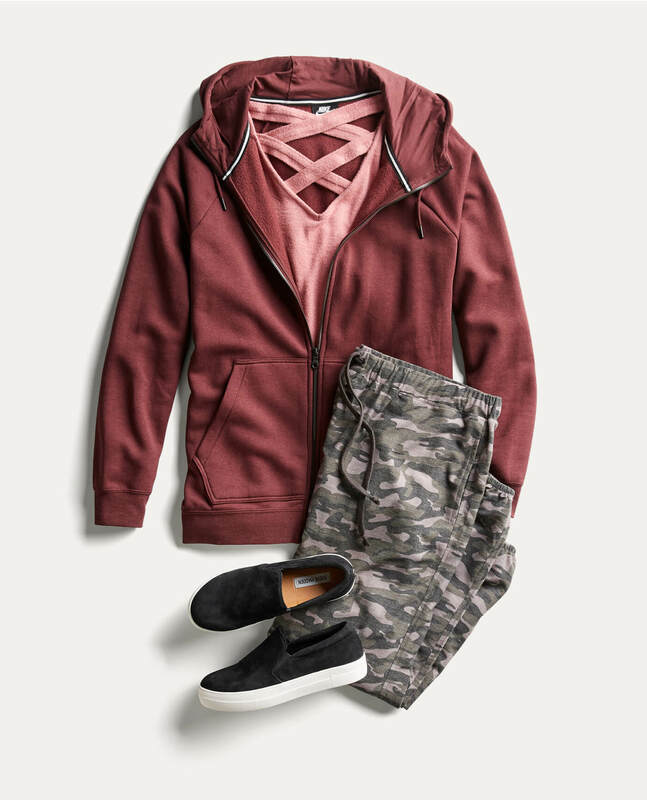 We especially love them in prints like camo, and paired with a neutral sneaker, your favorite jean jacket and a pullover pop of color. Fitted joggers with a bright zip-up pullover give this athleisure look the right amount of contrast and cheer. 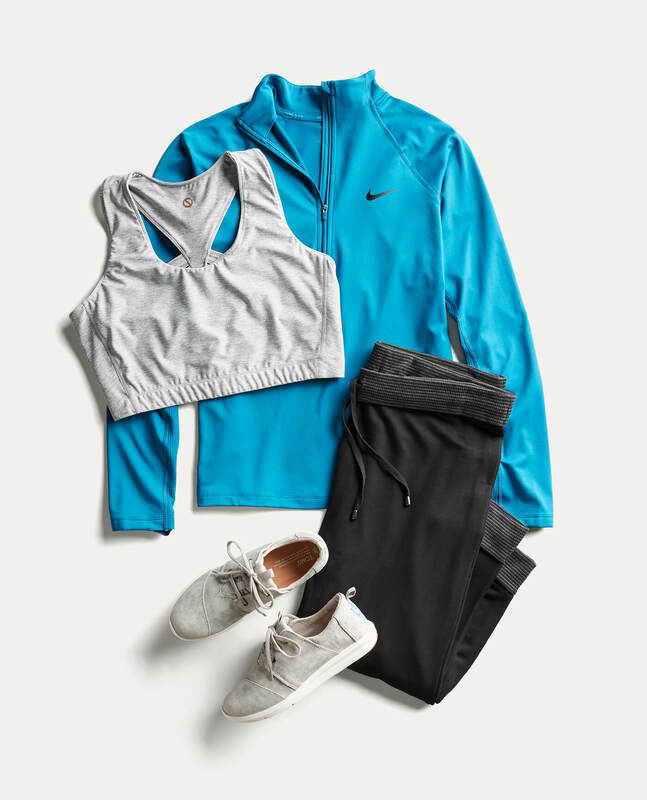 Add a supportive performance bra to the mix, and you have all the essentials you’ll need for a brisk run at the gym, in the park or to the market. 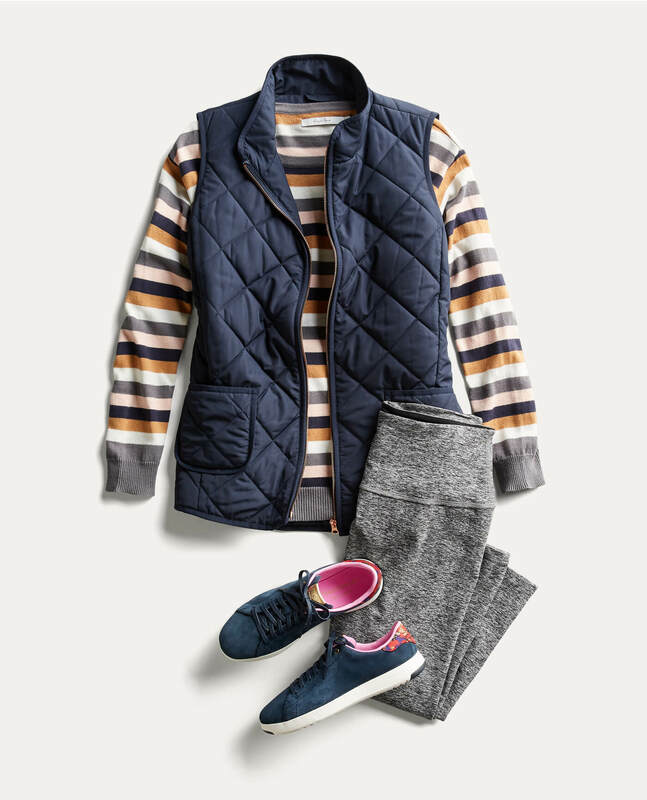 Get into a quilted vest, one of the most versatile items you can have in your athleisure arsenal. Details like stripes and matching dark colored sneakers add visual interest and upgrade this casual look. 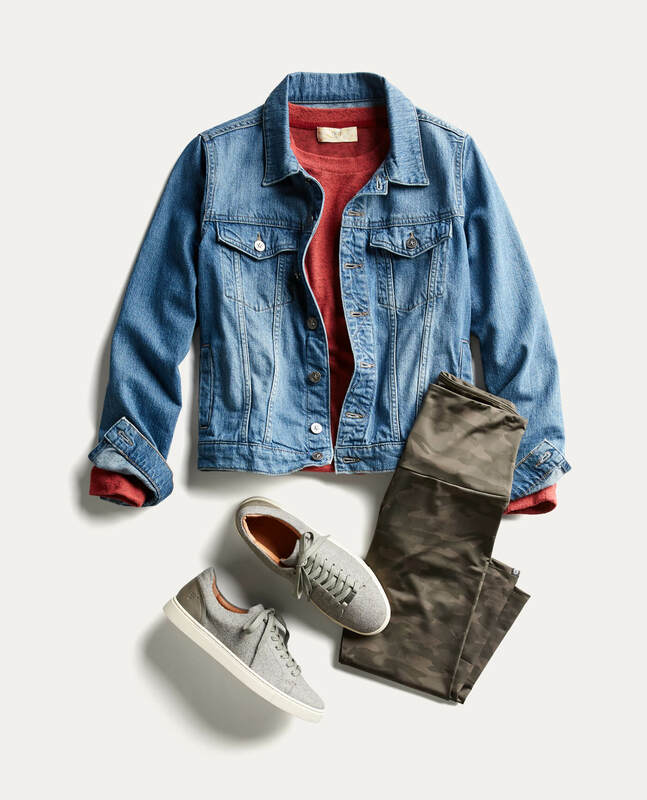 A cropped lightweight jacket is ideal for misty mornings on the way to meet friends for coffee and a quick doggie play date at the dog park. We like the soft look of heather grey joggers with a subtle, pastel camo knit shirt, and a neutral fur-lined sneaker to complete the look. Ready for some athleisure? 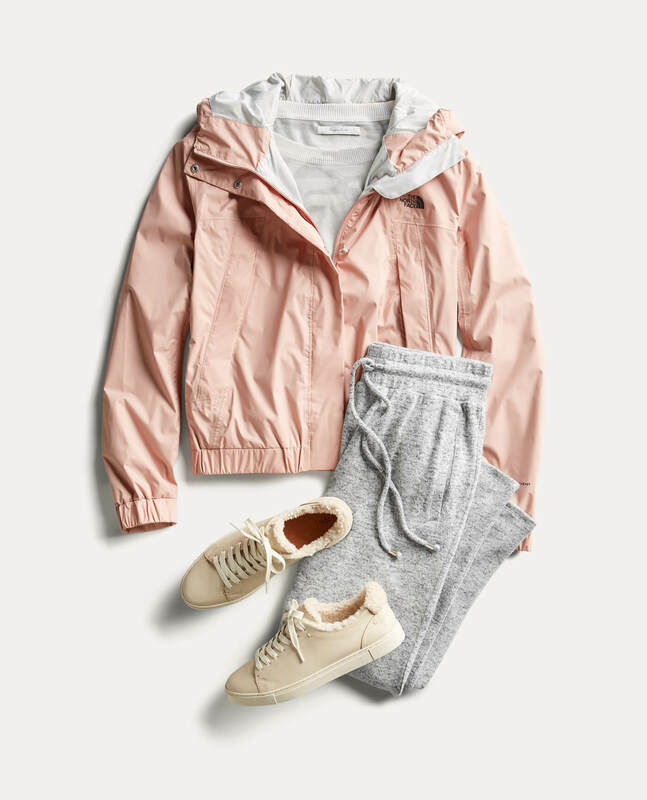 Ask your Stylist to choose athleisure pieces you’d love to sport in your next Fix.